(“The Pavilion” plays at the Cinnabar Theater in Petaluma from September 6 through September 22, 2013). Craig Wright‘s lovingly sentimental “The Pavillion” unfolds at a small town 20-year high school reunion, where Peter (Nathan Cummings) appears unexpectedly to plea for forgiveness from Kari (Sami Granberg), the girl he abandoned 20 years previously when he learned she was pregnant with his child. He has carried a torch all these years. It is no surprise that Kari is not exactly enthusiastic. The reunion is peopled with various small town types, whose problems are simultaneously worn cliche’s yet true to life. The twist that Craig Wright offers is the introduction of “The Narrator”, a character clearly inspired by the Stage Manager in Thornton Wilder’s beloved classic, “Our Town”. Indeed, Mr. Wright is pretty much exploring the same territory. Jeff Coté gives a gem of a performance as The Narrator in Cinnabar Theater’s fine production of Craig Wright’s “Th Pavilion”. Photo Credit: Eric Chazankin. The working out of this premise is saved from being a shallow cliche by Wright’s excellent writing and a capable cast. Wright’s dialogue is sharp, precise and often very funny. In an interesting ploy, all of the many characters present at the reunion are played by The Narrator, except for the estranged couple. 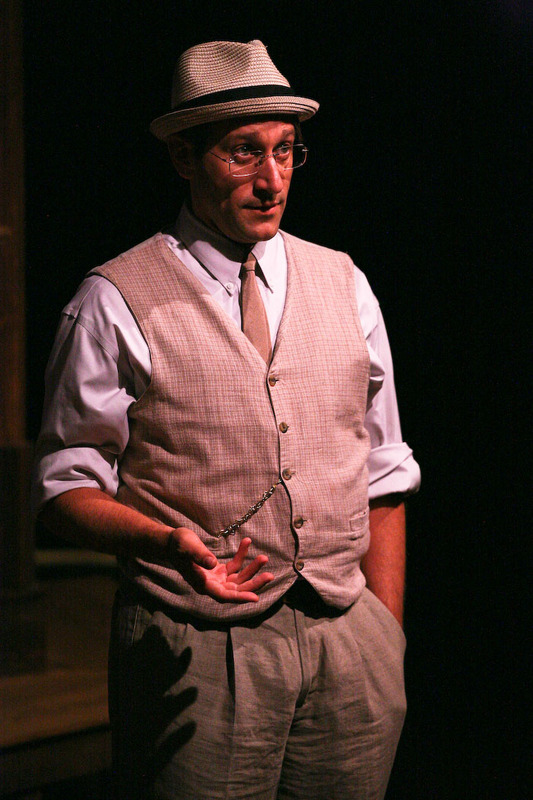 Jeff Coté is marvelous as The Narrator, creating a seemingly endless parade of town characters. He successfully differentiates each character, sometimes switching back and forth in seconds, and never confuses the various story lines. He creates the illusion that the stage is crowded with people. His performance deserves an award. The Cinnabar Theater is a long standing and beloved institution in Petaluma. Terrence Keane (formerly of Berkeley Repertory) has recently come on board as Executive Director, a move that augurs well for the future. “The Pavilion” by Craig Wright, produced by Cinnabar Theater. Director: Tara Blau. Scenic Designer: Pamela Pete Johnson. Lighting Designer: Wayne Hovey. Narrator: Jeff Coté. Peter: Nathan Cummings. Kari: Sami Granberg.